Perth’s iconic Yagan Square designed by Lyons Architects, iredale pedersen hook architects and Aspect Studios and development by the Metropolitan Redevelopment Authority has won two awards at the UDIA National Awards presented on the Gold Coast last night including in the Urban Renewal category and the prestigious President’s Award. The President’s Award is bestowed on the ‘best of the best’ of all projects entered into the National Awards program – testament to the success of Yagan Square. The national judges said that Yagan Square was a ‘transformational project for Perth…which sets new benchmarks across a range of metrics’. Yagan Square has successfully re linked the city with Northbridge for the first time in over a century and provides a masterclass in successful community engagement, particularly with traditional owners, which is reflected in the built form and the immersive cultural experience for visitors. 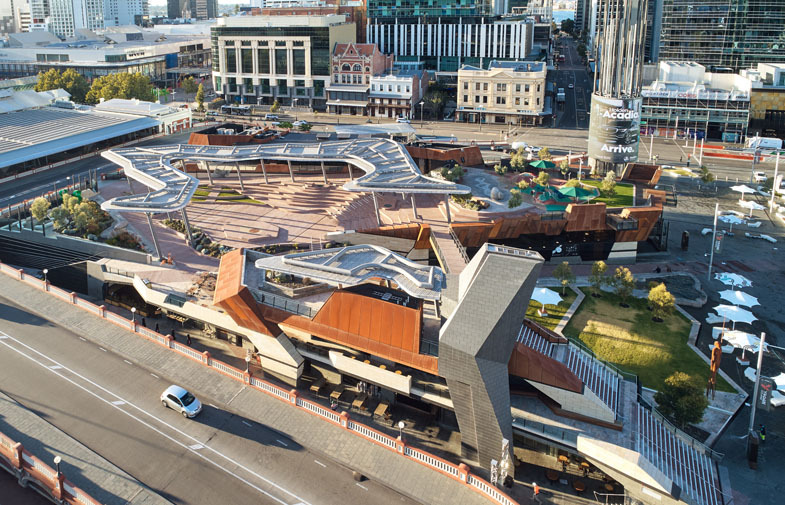 Yagan Square incorporates unique, iconic architecture and design and innovative construction to achieve a flagship public space that celebrates Western Australia through local produce and fostering community connection. Yagan Square has vastly enhanced movement and connectivity within the city by linking seamlessly with surrounding landmarks and bridging a geographical divide that existed between the CBD and Northbridge. The new civic space features an array of public amenities for visitors to enjoy including the fantastic Market Hall eatery, outdoor playspace, wildflower garden, digital tower, artworks and an amphitheatre.